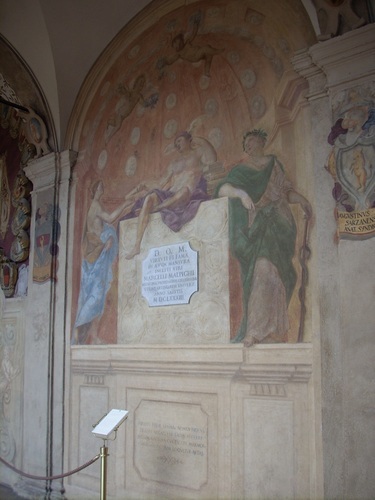 This memorial fresco in honour of Marcello Malpighi was painted in the Palazzo dell'Archiginnasio (Piazza Galvani 1) - then the main seat of Bologna's University - by italian artist Marcantonio Franceschini between 1683 and 1687, while the scientist was still alive. 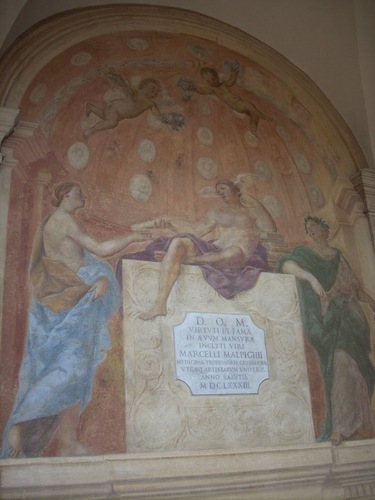 In the classical-style representation, Mercury, symbol of Eloquence and Reason, entrusts a parchment with the name of the scientist to Eternity, while Medicine, with caduceus in her hand is watching the scene. 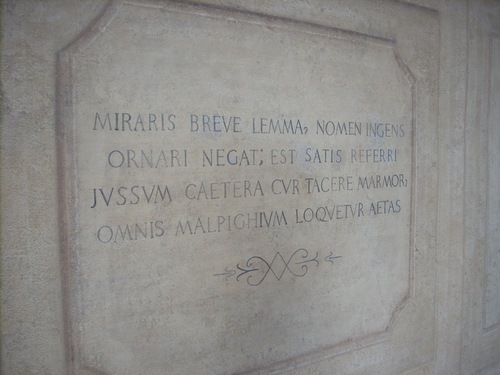 A painted latin inscription at the bottom of the fresco reads as follows: "MIRARIS BREVE LEMMA? NOMEN INGENS / ORNARI NEGANS; EST SATIS REFERRI / JUSSUM CAETERA CUR TACERE MARMOR? / OMNIS MALPIGHIUM LOQUETUR AETAS". 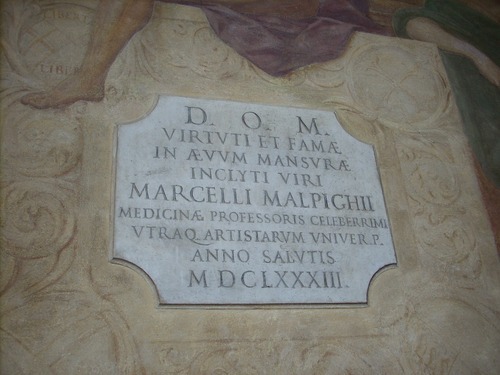 On the marble tablet embedded in the fresco, the following latin statement can be read: "D. O. M. / VIRTUTI ET FAMAE / IN AEVUM MANSURAE / INCLYTI VIRI MARCELLI MALPIGHII / MEDICINAE PROFESSORI CELEBERRIMI / UTRAQ. ARTISTARUM UNIVER. P. / ANNO SALUTIS / MDCLXXXIII".